This article will describe how to configure your Rational Team server with a DB2 database server by leveraging DB2’s High Availability and Disaster Recovery (HADR) feature. This configuration will allow minimizing down time of the Rational Team Concert server from software or hardware failures that may occur on the system where the database repository resides. Rational Team Concert uses a relational database system as a back end repository to store all the information. Most popular relational databases such as Oracle, Microsoft SQL and DB2 are supported by Rational Team Concert. It is very important to minimize the effects of failures on the repository in order to maximize your team’s business operations. Down times occur when a database is unavailable due to planned or unplanned database server outages. High availability systems are those systems that are available to users for business operations almost all the time. Database high availability is implemented by synchronizing and replicating data between two database servers, which are called the primary and standby servers. In cases when the primary database server becomes unavailable, all requests are re-routed to the standby server to recover from a failure with a minimal server interruption. The standby server becomes the new primary server in this case. The High Availability and Disaster Recovery (HADR) feature is a replication service for DB2 databases that provides high availability functionality. The feature comes for free with DB2 Enterprise Server and can be purchased as an add-on capability to DB2 Express and Workgroup editions. Rational Team Concert uses a DB2 JDBC client to connect to a DB2 database. The next sections will guide the reader through all the necessary steps required to configure Rational Team Concert with a high availability DB2 database. The CPU architecture should be the same on both servers. It is also recommended that the size of RAM should match on both machines so that users will not see any performance difference after a database switchover. The DB2 Data Server version installed on the primary and back up servers should match. This article discusses how database high availability prevents Rational Team Concert from experiencing database failures due to software or hardware errors. Failures can also occur on the Web Application Server side where the Rational Team Concert application is hosted, preventing access to business information. For more information on this topic, please refer to "Deploying Rational Team Concert 2.0 on WebSphere Application Server for high availability using idle standby". Install and configure DB2 data server on the primary and standby machines. Note that if you use DB2 Express or Workstation edition, you will need a HADR add-on. DB2 Enterprise edition comes with the HADR feature. Set up Rational Team Concert with IBM DB2 server on the primary server. The step-by-step instructions on how to complete the setup can be found at http://publib.boulder.ibm.com/infocenter/rtc/v2r0m0/index.jsp. Later, this database will be recreated on the standby server. At this point you should have your Rational Team Concert configured with an IBM DB2 database without the high availability feature. Before proceeding with configuring HADR for your database, make sure your Rational Team Concert server is not running. This will prevent you from connecting to the database while you are configuring high availability and disaster recovery for your database. As depicted on figure 1, the standby and primary databases communicate via TCP/IP and thus you need to open ports on the operating systems where the databases are hosted. Ports can be specified by editing /etc/services for Linux/Unix and c:windowssystem32driversetcservices for Windows operating system types respectively. When choosing a port number, make sure it is unique to the system and does not create conflicts. Now we can configure HADR parameters for your standby and primary databases. Run the following commands with appropriate information on the primary data server first. It is assumed that a DB2 database named JAZZHADR is created and ready for use. You will get output similar to what is shown below. The primary database needs to be activated first, and then HADR can be started. Verify that the primary database’s role is correct. 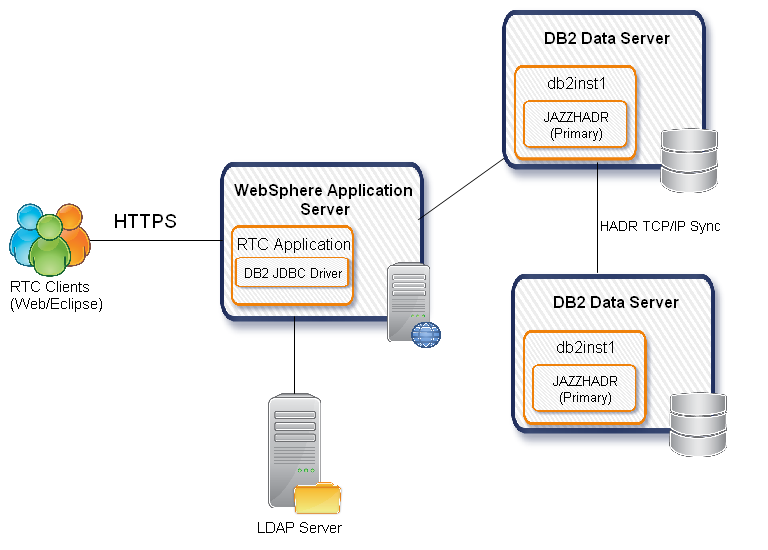 When RTC is configured with a DB2 database, it uses the DB2 JDBC java driver to connect to the repository. Since your database is configured with HADR, the JDBC driver gets an alternate (standby) data server’s information when connected to the primary data server. This allows the RTC server to switch database transactions to the alternate server when the primary server is not available. This particular functionality is called Automatic Client Re-routing. In this case, your primary database is not available and synchronization does not happen with the standby database. RTC cannot automatically re-direct all connections to the standby database server since its state becomes "Remote catch up pending". In order for RTC to start re-directing transactions to the standby server, a "takeover by force" command should be executed on the standby server. After this command is executed on the standby server, the state of the JAZZHADR database will become Primary. Now RTC will be able to connect to the new primary database.